January was a slow reading month for me. I started several books but just couldn’t get into anything. 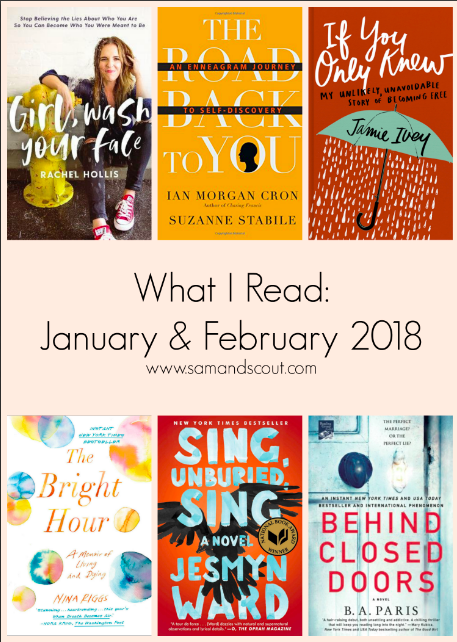 BUT, in February, I made up for it… I finished a couple of those books (they just took a while to hook me) and then got the reading bug and just kept going… Total, in January and February, I read six books for myself (i.e. not including books I read with Sam or for/in my classes). My goal for 2018 is to read 30 books, so I feel like I’m off to a good start. This one had such rave reviews (Laura Tremaine called it the best book she read in 2017) that I thought it was going to be an instant slam dunk; but it actually took a while for me to get into it, and I found it quite slow for the first 50 – 60%. The writing is beautiful but, at times, it felt a little too wordy/descriptive and – this sounds terrible – artistic for my taste. I also listened to it on Audible, and I think the different voices (the chapters rotate between a few narrators/characters) sometimes confused me. I actually think this one would have been a better one to read, but I’d already used the Audible credit. Haha. All that said, once I finally got into it though I really did like the story. The characters were believable and sparked some pretty big feelings in me. The plot tackles some intense topics like racism, drug use, death, etc. This really made me think about the challenge it is for people to escape the “cycle of oppression,” for example. All in all, it wasn’t my favorite book ever (or even recently), but I’m not surprised that it got a lot of attention and, ultimately, won the National Book Award for 2017. The writing is really rich and it is full of deeper meanings, symbols, etc. It’s worth a read, just maybe don’t set your hopes quite as high as I did. I’ve mentioned before here that I found this book after reading this article about Riggs’ husband starting to date Lucy Kalanthi (Paul Kalanthi of When Breath Becomes Air‘s widow). Fair warning: the story is not a happy one. It is a memoir chronicling the less-than-two-years between Rigg’s finding “one small spot” of breast cancer and her death. She was 37 years old, a mom to two young boys, a devoted wife, daughter, and friend, and a poet (her talent with words definitely shines). This – even more so than WBBA – struck chillingly close to home for me. At times, it was hard to read. Still , I’m glad I did… It encouraged me to make the most of this life, to value the people I love, and to find beauty in all things. I wish I’d known Nina in real life – I think she’s the kind of person who’d linger over coffee and discuss everything from literature to parenting to decorating – but her book is a good second best. If You Only Knew was Ivey’s first book, and I knew from the podcast that it was a dream of hers to share her story in this way. I bought it (like, an actual hard-cover book) because I was so excited for and proud of her. She feels like a friend, so of course I’d support her in this way… I also had a Barnes and Noble gift card, and I think the cover is super cute. 😉 And, I’ll admit, she did a pretty stellar job marketing and made me super curious as to what the “big secret” she’d been keeping (i.e. “if I only knew ______”) was. First, the style of the book was super conversational. Jamie wrote exactly like she speaks – which can be fun, but it just came off as too much to me. I guess I didn’t feel like the writing was very “polished.” (Blame the English teacher in me, but I want a book to read like a “final draft,” not like a blog post.) More than that, the “big reveals” in the book honestly didn’t seem like that big of a deal… Again, they were obviously a big deal to her, and I don’t mean ANY disrespect; but, I could’t help feeling like they were overplayed for the sake of suspense… Don’t get me wrong, I think it was vulnerable of her to openly share the parts of her life that would be easier to hide/forget; but, ultimately, I felt like her story was just pretty “regular.” Even some of her bigger confessions (particularly in Chapter 9 which is the part she said she was most nervous to share) were more about the temptation to sin than the sin itself. Overall, I think this book had some really wonderful parts and the heart behind it was clearly good; BUT, I think – with a few adjustments – it would have been better as a book for teen girls / very new believers. I get wanting to write a book for the demographic of people who already follow/love her, but I felt like the message/style was a bit too simplified for most of us. Read by the author, the audio-version was perfect… It was like one long coffee date with a friend – a friend who has become super successful because of her own hard work, is willing to share the not-so-perfect parts of her own story/life, truly cares about you / wants YOU to find success in whatever it is you care about, AND isn’t afraid to throw a little tough love your way and push you out of your comfort zone if need be. 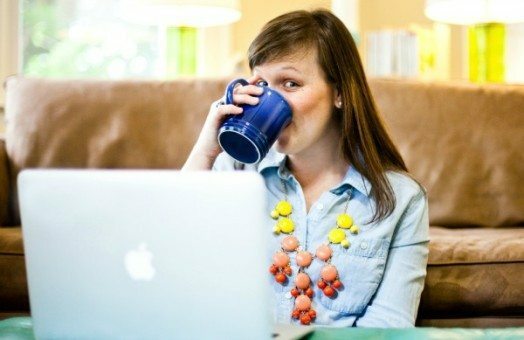 Who doesn’t want to have a 7 hour coffee date with that friend?!?! This book was empowering, encouraging, relatable, interesting, and well-written… Each chapter starts with a lie Hollis has believed herself (i.e. “I’m a bad mom”, or “I need a drink to relax”), tells a story about how that lie has played out in her life, and then calls the reader to the TRUTH and the tangible ACTION STEPS that will set her free. SO many of Hollis’s struggles echoed my own life — she is a 34 year-old working mom, after all — but even the ones that didn’t still kept my attention and offered wisdom/insight. Hollis lays it ALL on the table in this book. She talks about the things most of us would be afraid to bring up to anyone other than our closest friends with rawness and intimacy. She admits her struggles and her flaws, but she also shares what has worked for her to get her out of those darkest, deepest places. I finished the book in only a couple of days and was left feeling like I could do anything + I had lots of tangible tips and ideas for actually making those things happen. In short, this is one of the best “self-development” books I’ve read it in a while. If I could, I’d give a copy to every woman I know. How’s that for an endorsement? This one was a light, “beachy” read in the vein of Gone Girl. My mother-in-law and sister-in-law both recommended, and I thought I was due for some easy fiction, so I picked this up right at the end of the month. Then, I preceded to stay up WAY too late several nights in a row to finish it. It was great. Since this isn’t a new release (it came out back in 2016, I believe), I hadn’t heard anything about it before I started reading it, and the plot totally caught me off guard and drew me in. This was a definite page-turner, the ending was satisfying, and I found myself thinking about it (and being sad it was over) several days after I finished. Honestly, I’m surprised it hasn’t gotten more attention. There you go. Have you read any of these? If so, what did you think?!? 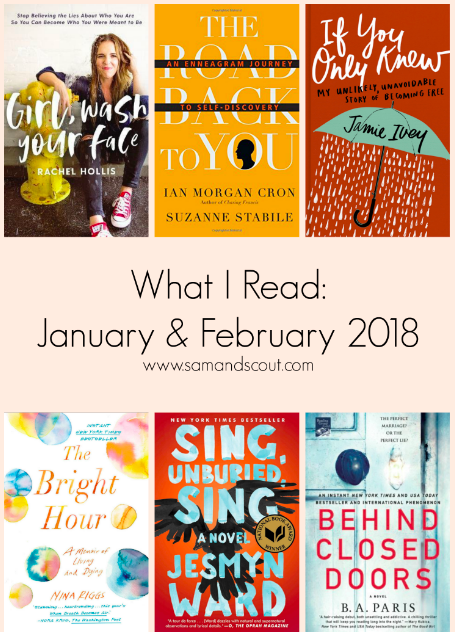 It feels good to start the year on a reading kick, and though I have plenty of good titles on my TBR list to keep me going, I’m always looking for more… What are you reading lately? I felt the same as you about Sing, Unburied, Sing. It was just a little TOO artsy for me, but I did very much appreciate the story. I can imagine how hard it would have been to follow if you were just listening to it!! I read Behind Closed Doors in January, I think, and LOOOOOVED it!! I agree- that ending?!?!??! Amazing. What color was her room, Grace?? Yessssssssss. I am honestly offended by the number of my personal friends who have this as 2 or 3 stars on GoodReads. They are all sorts of wrong. Hahaha! What?!?! Those friends are crazy! I thought it was so refreshingly different from all the other “thrillers” out there. I loved it!